Is it safe to cut costs when it comes to trimming trees that grow close to power lines? There was no time to spare, but Rick knew his wife, Janet, who was visiting her mother, would not forgive him if he didn’t tell her what was happening. Janet Lucich will never forget the feeling in her gut when she picked up the phone and heard her husband’s voice. “You just stop breathing, you can’t get there quick enough. It was horrible,” she said. Rick and his two sons, both in their twenties, had packed up the car to make a quick exit. But the fire was too fast. It had leapt across the valley below them and cut off the only road out. With fire and smoke at their backs, and machetes in their fists, they started whacking at the dense brush behind their house, inching their way through sharp nettles that sliced through their arms and legs with every step. “You woke up to lots of birds singing, the smell in the morning was wonderful, the fresh dew on the leaves, it was incredible,” said Janet. There was no time to spare, but Rick knew his wife, Janet, who was visiting her father, wouldn't forgive him if he didn’t tell her what was happening. Janet Lucich will never forget the feeling in her gut when she picked up the phone and heard her husband’s voice. “You just stop breathing, you can’t get there quick enough. It was horrible,” she said. Rick and his two sons, both in their twenties, had packed up the car to make a quick getaway. But the fire was too fast for them. It had leapt across the valley below them and cut off the only road out of their property. With fire and smoke at their backs, and machetes in their fists, they started whacking at the dense brush behind their house, inching their way through dense brush. They beat the fire by cutting their way down into a valley and hiking for miles to safety. The hot flames, fueled by the drought stricken trees and grass, destroyed every single thing they own - except for two little port glasses. Two weeks after the fire, the Lucich’s were able to return to their property. A lifetime worth of photographs and a home they considered paradise - reduced to ashes. Janet eventually made it back with her husband and sons to see the rubble. She cries when she thinks about what they lost. The fire levelled more than 500 other homes, and burned 70-thousand acres. It all started on the afternoon of September 9, 2015, when a single tree – a gray pine – hit a power line. Cal-Fire and the Public Utilities Commission investigated, and concluded that a PG&E contractor made a serious error that led to the fire. She called for the removal of two trees which were close to a power line. Experts say the contractor should have known that removing the first two trees would weaken a tree directly behind them. Trees on the inside of a stand of trees tend to be less stable. And, when the outer trees were cut, the inside tree grew towards the sun, and leaned into the power line. Just one tree led to a catastrophe. According to PG&E– 55 million trees are at risk of hitting power lines. But in court documents, NBC Bay Area learned about a PG&E program that pushes contractors to work on fewer trees every year. The company sets targets – and pays bonuses to contractors who meet those goals. PG&E says in court papers the program encourages contractors to work the “right trees more aggressively.” Instead of continuously trimming trees, the company incentivizes contractors to remove them – and reduce the workload in the future. Pitre points to a court deposition in which a manager at the same contracting company is asked if he believes the bonus system “incentivizes his people to not do their job.” He answers – “that is a concern” though he says he never brought it up to PG&E. Eckert has 40 years of experience designing vegetation management systems for utility companies. He may be called as a witness for the plaintiffs in this case. He says when incentive programs fail – it’s because of unqualified people. “I’ve seen trees missed, I’ve seen trees improperly pruned such that they grow back faster,” he said. The Lucich’s had created an off-the-grid Garden of Eden, but since the fire, rebuilding is on hold until PG&E settles their case. 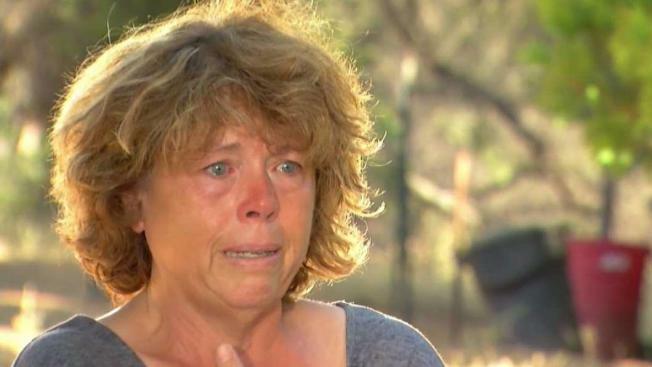 The family is still waiting to rebuild…and waiting for answers from PG&E. The judge in this case doesn’t believe PG&E’s incentive program contributed to the fire. But the program remains controversial. The utility says it’s reinvesting the money it saves from trimming fewer trees – into safety programs. But another NBC Bay Area investigation shows how those programs can also be used to boost executive bonuses. Follow Liz Wagner on Facebook and Twitter.